No Thread Slot? No Problem! What do you do when using a presser foot that does not have a thread slot to pull the thread through to the back, such as Clear Embroidery Foot #39/39C? Try this trick to get that thread out of the way, keeping it from getting tangled as you start sewing. 1. Thread the machine and put the needle in the highest position. Tip: If available, touch the Needle Stop Up button and the needle will go to the highest position. 2. Without attaching the foot to the machine, slip the foot up onto the needle through the needle opening so that the threaded eye is below the foot. 3. Pull the thread down under the foot and to the back, then attach the foot to the machine as usual. Previous Previous post: Join WeAllSew on Instagram! Or…thread the needle with the foot in place, bring up bobbin thread with needle-down/up, lift presser foot. Grab both threads and pull out of way. Or, lower needle, with stylus or something longish, flick thread toward the back. I just put a scrap of fabric under the foot and take a stitch lift the foot and pull out the fabric and your thread is through the foot and you can start sewing. Works with any foot without a thread slot. 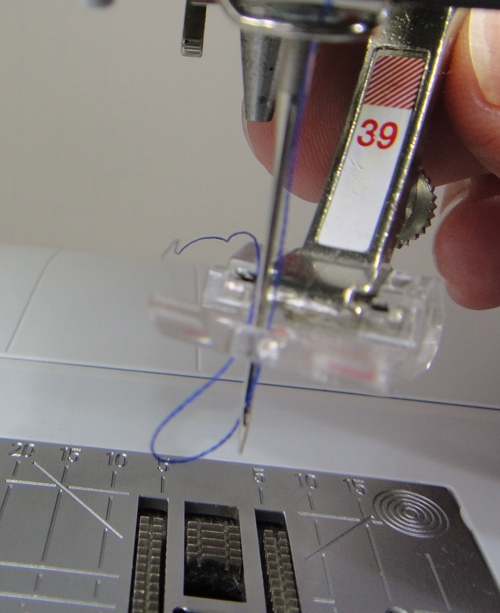 I use my Bernina tweezers to pull out the thread. Which ever way you find best, take your foot off the foot pedal. One could use a floss threader for dental floss. I have used one for years for my serger.